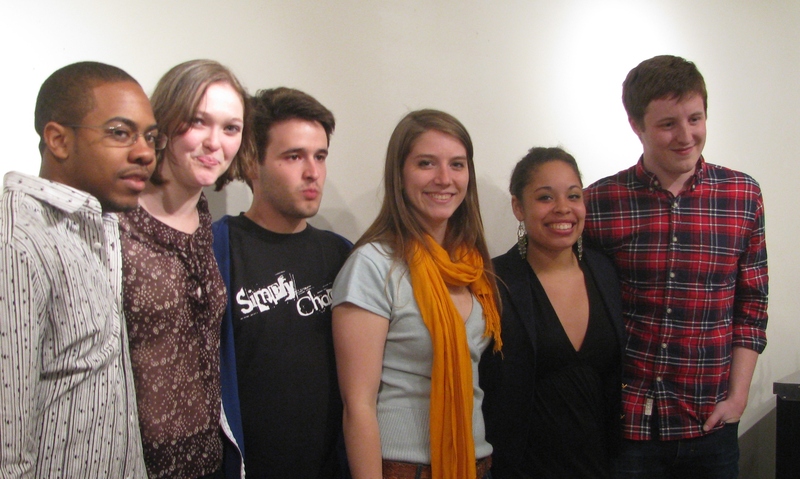 From left, Cortney Charleston, Hannah Van Sciver, Seth Simons, Jillian Blackwell, Victoria Ford, and Richard Thomson. It was part witty and hilarious stand-up comedy, part heart-and-soul-felt reflection on personal experience, part astute observation on life, and all amazing. Six members of the University of Pennsylvania’s Excelano Project brought their spoken word show/poetry slam to Cotuit Center for the Arts on Saturday, April 28, to the delight of those in attendance. Performing their works alone and in groups, each told their own stories in short bursts of passion and quiet moments of sober reflection. Each poet has clearly found—or is experimenting with—his or her own voice. Not a regular attendee of poetry slams, I was not quite sure what to expect, but poet Hannah Van Sciver, a sophomore (and the reason for the Excelano Project visit—she is from Cape Cod and and enjoyed performances and classes at Cotuit Center for the Arts while growing up), and Richard Thomson, a junior, gave us a fine introduction. While the audience did not engage much in fingersnapping (not being used to it, I found it a little distracting myself), they clearly had fun. The poetry brought generated laughter and appreciation, good feeling, and awe of the talents of these young people, so eloquent in their words, and so expressive in their presentation of their poems, all from the heart, more than from memory. “and everything we hope to be,” concluded Richard. The acoustics were great at Cotuit Center for the Arts, and we could hear the words clearly. I would have loved to be able to rewind, though, to savor and reflect upon the torrent of words and phrases and thoughts, and their interconnections, a little more slowly. But then it wouldn’t be a poetry slam—and the poets’ intensity added so much to their words. And, as with music, sometimes the specific words are secondary, so long as the rhythm is strong and the feelings authentic. Next was “Round Drain, Round Glasses,” an emotional poem by senior Jillian Blackwell about her father: “I am standing in the bathtub crying. . . . There is a lot of pain, insight, and recovery in both works, and Victoria’s presentation made them all the more meaningful. She writes, she said on Excelano web page, because it is a healing. In her funny and perceptive poem, “Cheshire Cat,” Hannah writes about love. You are the dirtiest four-letter word I know. You are the rick-roll pop-up video. You are a urinal on display at the MOMA…. “I had been trying for weeks to write any poem that wasn’t a love poem. The poem is wonderfully full of words and images tumbling over each other, and, fortunately, it can be found on Hannah’s Excelano Project page. “Short Poems” were presented several times during the evening, each heralded by a group of poets shouting “short poems!” with great excitement. These poems were very short and very funny, displaying, like the longer poems, the poets’ love of language, life, and ideas. Poetry does makes sense, though, even if your interpretation may differ from mine, or that intended by the poet,a nd if they change from time to time. “Excelano” does not mean “excellence,” as one might assume, but, according to the Excelano Project website, it means “we march forth,” an expression of the group’s vitality and purpose, to give voice to its members, and to touch the lives of audience members, through progressive thinking and artistic expression. The Excelano Project website is at www.excelanoproject.com. You will find poetry there, and links to videos. You can also find other performances on YouTube. “Van Gogh’s Ear for Music,” the group’s 10th anniversary chapbook, was available for purchase at the event. For more information on the chapbook, e-mail Excelano.Project@gmail.com.